Gammon cooked in cola is surprisingly excellent! The first reaction is usually "That will never work! ", but the sweetness of the cola nicely balances any salt used in the curing of the gammon. The addition of some subtle spicing to the cooking liquid, and finishing off with a maple syrup and grain mustard glaze, makes this a truly irresistible dish. 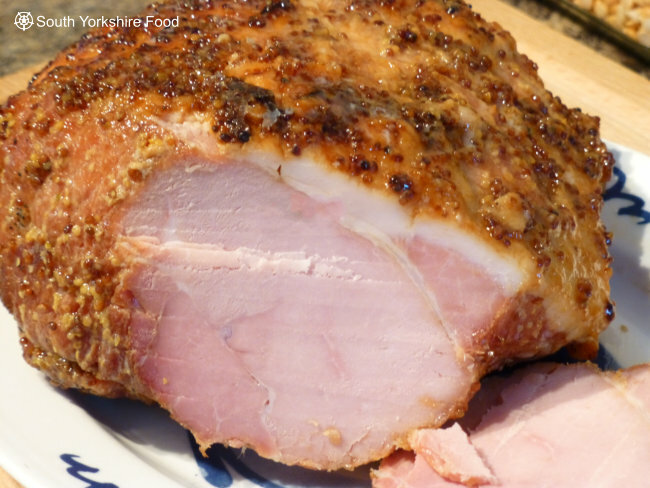 You will never cook gammon any other way. Serves 6-8. Put the gammon, vegetables and spices in a large pan and pour in the cola. If the meat is not covered by the liquid, top up the pan with water until it is covered. Put the pan on the hob and bring it to a boil. Turn it down to a simmer, cover the pan and cook for 2 hours. Check the pan occasionally, and if necessary top up with boiling water to ensure that the joint remains covered throughout the cooking. After 2 hours remove the gammon from the pan and place it on a dish until it is cool enough to handle. When it is cool enough to touch, use a sharp knife to carefully remove the skin, and most of the fat. Leave a thin layer of fat on top of the joint. Heat the oven to 190°C/170°C fan/375°F. Put the gammon joint in a roasting tray, fat side up, and carefully score the fat into a diamond pattern. Mix up the glaze, and pour half of the mixture over the joint, ensuring all the fat has a coating. Remove from the oven, pour the remaining half of the glaze over the joint and return to the oven for a further 30 minutes. Delicious served hot from the oven, or cold with salad or in sandwiches.